StarUML v2.8.0 is now available for download. This release includes the following features and fixed issues. Now you can see stereotype icons in Model Explorer. It makes you easier to identify stereotypes (e.g. 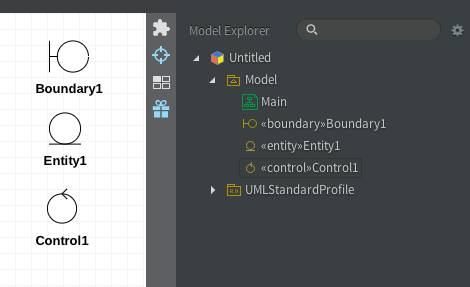 boundary, entity, control) in the Model Explorer. Note that boundary, entity, control stereotypes included in the previous version (2.7.0 or lower) are not shown in Model Explorer. 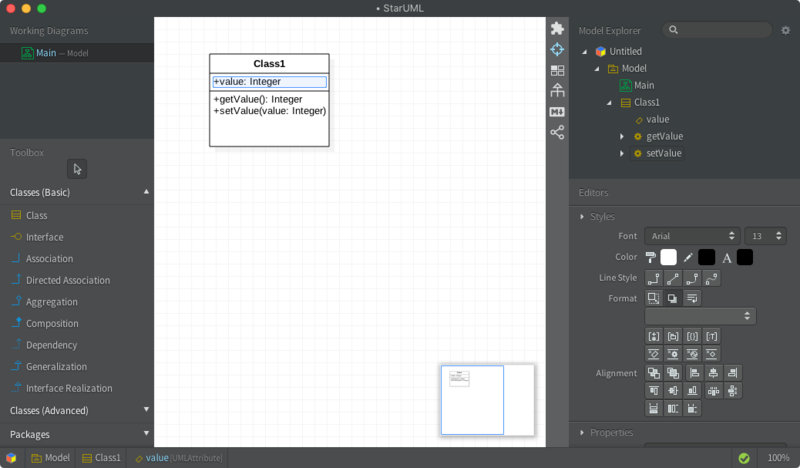 To show the icons, you need to re-apply UML Standard Profile and re-bind the stereotypes in this new version (2.8.0). Word wrap for attributes, operations and other text elements. Now you can set word wrap for most of text elements including attributes, operations, association roles, etc. Word wrap settings are saved to the file, so these are restored when you loaded from file. Word wrap for attributes, operations, etc. PostgreSQL extension developed by Adrian Andrei is available in Extension Registry. It allows you to generate DDL from ERD model to PostgreSQL DDL. This extension is open source and hosted on Github (https://github.com/adrianandrei-ca/staruml-postgresql). Thanks to Adrian. TypeScript extension developed by Thomas Min is available in Extension Registry. It allows you to generate code from UML model to TypeScript code. This extension is open source and hosted on Github (https://github.com/yeoupooh/staruml-typescript). Thanks to Thomas. PanesManager extension developed by David Oudart is available in Extension Registry. It adds two buttons in the statusbar of the interface (bottom bar) to toggle the Sidebar (left pane) and the Navigator (right pane) of the window. This extension is open source and hosted on Github (https://github.com/pixdad/PanesManager). Thanks to David. DDL (Data Definition Language) generation extension developed by Minkyu Lee is available in Extension Registry. It allows you to generate DDL from a data model (ERD). This extension is open source and hosted on Github (https://github.com/niklauslee/staruml-ddl). An extension for generating getters and setters developed by Minkyu Lee is available in Extension Registry. It allows you to generate getters and setters for selected attributes or selected classes. This extension is open source and hosted on Github (https://github.com/niklauslee/staruml-gettersetter).